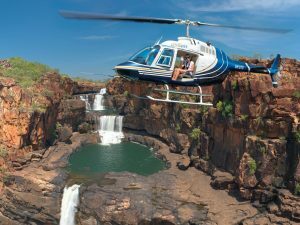 The 18 minute Mitchell Falls helicopter flight gives thrilling views of the many gorges and falls of the Mitchell Plateau. 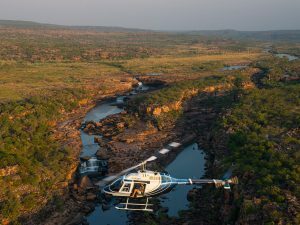 This flight takes you downstream the Mitchell River enjoying close up views of the many waterholes and rock pools, to the lower Mitchell Falls and further downstream to the point where the fresh water meets the salt water from the Indian Ocean. Orbit the lower Mitchell falls and fly back via the western gorge, on to JCR gorge and falls , which is south west of the Mitchell Falls. Then soar up the river to the spectacular Mitchell Falls and Mertens Gorge. The walk in to the Mitchell Falls from the campground is about 3 km one way and can take from 1.5 to 3 hours, depending on how much you want to see. The walk passes little Mertens Falls and galleries of ancient rock art which are well worth looking at. This 18 minute Mitchell Falls helicopter flight can transfer you from the helipad at the top of the Mitchell Falls back to the campground, or take you in and drop you off. Read about our longer flight that includes the stunning Kimberley coast here. A portion of your tour price goes back to the Traditional Owners of the land.